16 milliseconds is not a lot of time. Try eating a hotdog that fast – though I swear I’ve seen our dog go through a beef sausage in under 100 milliseconds. If you want your game to run at 60 frames per second, 16 milliseconds is all you have to get everything done: moving bullets around, creating new entities, drawing sprites, checking collisions, tracking and changing states, handling input and playing sound. Whatever happens regularly in the main game cycle needs to operate as efficiently as possible. Even at a lower-performing frame rate of 30 per second, you’ll still only have 32 milliseconds to get everything done. Speed and efficiency are important, and that importance increases over time as you add more things to your game. What’s garbage collection, and why do I care? If you’re developing a game that has many things happening at the same time, say a weapon that fires missiles 5 times per second – not an unreasonable weapon fire rate for a high-speed shooter – you’ll quickly discover that one area of substantial impact to performance is object construction and subsequent garbage collection. As your classes grow in size, and possibly in complexity, you’ll begin to notice lag introduced when you construct something new; this is exacerbated if you’re doing complex setup of sprites and sounds (even if they are cached in static resources). Creating lots of objects also has the side effect of generating garbage collection. Depending on the browser, and number of objects you have in use, the process of garbage collection can take anywhere from 10ms to 2000ms. The more things it has to check to be cleaned, and the more cleaning it has to do, the longer it will take. If you’re writing a game with independently moving objects, like an action game, this pause is going to at best noticeable, or, at worst, a series of frustrating stalls that kills the experience. After the function test has executed, the variable myString will be marked as available to be freed/deleted. This is because the function creates a scope for the variables declared within it. Upon entering the function the browser will create space for the myString variable, and once it ends, everything created in that scope will be marked for collection. At some point later (it’s up to the browser to determine when that is) the GC will run and the myString object will be “truly” removed and memory freed up. In this case, the another variable, which is in global scope, is a reference to the string created inside the function. Since the scope is global, the garbage collector will continue to think it’s active. Without the var keyword you could be assuming the b variable will be freed because the function has gone out of scope, which is not the case. So this raises the question of how do you really make sure the stuff you create gets deleted, i.e. cleaned up by the garbage collector? s.data will now be undefined (and also marked for removal by the garbage collector). The delete call will run just fine, but it will silently fail to delete the variable (since it’s not a property) and therefore the reference won’t be cleared and the memory won’t be reclaimed by the garbage collector. The delete call will actually return false, to indicate the variable couldn’t be deleted; how nice of it. The right way to clear a variable is pretty simple: set every reference it to to null, then let the garbage collector do its job. Then the data variable is going to be automatically cleared up as well – since no reference remains to it because its outer-scoped parent object s was cleared. Even if you minimize how many objects you create, you’ll still be chewing through memory. To keep track of how much you’re using, and how hard the garbage collector is working to keep up with you, you can use a pretty simple technique. Save the script and use it as your new Chrome launcher. 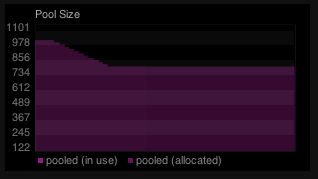 This code runs every 100ms and checks to see if the amount of memory in use on the heap (the value of usedJSHeapSize) is smaller than the last time we cycled. If we’ve suddenly used less, then we know the garbage collector has stepped in and freed up memory. This is just a simple example. It’s pretty easy to add things like checking the memory consumption along the way, or showing a delta to see how much memory is being used over time. Using these variables I added a dynamic graph to Playcraft’s debugging panel that shows the heap data in real time. It’s blue and shiny, but that’s optional. Once you’ve eliminated as many cases of excessive object creation as you can, you’ll still be left with objects you just absolutely can’t avoid creating during that high-speed cycling of your game. Weapons fire, particle rain and explosive debris are all cases where you can be creating and destroying tens of objects per second. Have too many of these happening at the same time, and you’ll quickly start to see garbage collector pauses. And here’s the ultimate solution to the performance issues relating to creating and destroying objects: don’t. Well, at least, minimize the number of times objects are being created and destroyed. A great technique for doing that is known as object pooling. In simple terms, object pooling is the process of creating a pool of objects once, but instead of deleting an object when it’s finished being used (such as a bullet hitting a wall and exploding), you return it to the pool for later use. Your game then only cycles and renders the objects that are marked as active. Because the object is never dereferenced (deleted) it won’t be garbage collected, thus you can avoid both the creation of the new object, as well as the deleting. This will avoid construction by just returning one of the pre-constructed objects from the array, or if there are none available, fall back to constructing another bullet – essentially automatically expanding the pool. So that’s all cool, but in a complex game there are still some issues: first, as your game gets bigger you’re writing lots of code to support pooling on all the different types of objects. Second, without Array.indexOf (not supported in IE8) you have to sweep through the entire array in order to remove an object from the used object pool, which is slow. Which will create a gamecore.js directory. Notice how the class now uses a statically inherited create method, and the instance init constructor is now empty. That’s because objects are constructed by the pool automatically, without parameters. It’s only when you call the create method that the parameters are relevant. You have the option of adding construction to the init method, such as loading a sprite or configuring complex class properties, but generally it’s just setup stuff. The gamecore.js pooling system will automatically take care of creating and managing the pools, as well as expanding the pool if it runs out. Internally, gamecore.js is using high-speed doubly-linked lists to quickly move objects between the used and free pools. This works well even in IE8. Pooling is a great boost to speed up your game, however as you start to use it more in your code you’ll inevitably forget to release an object back into the pool. This will cause the pools to grow in size, and you’ll be wasting resources creating more objects than you need. To help with this problem, gamecore.js includes two nifty features: pool stats and allocation tracing. I often bind a keyboard input so I can dump the stats at any point in a game, that way you can see where objects are being created, and usually quickly see if pools are growing beyond what they should be – which usually leads to a memory leak. In the Playcraft engine we adapted this to show a real-time feedback graph of the state of the pooling system. If you do find cases where objects are not being released back into the pool, the next step is to try to figure out where they are being allocated in your code. Gamecore.js has a neat tracing feature that, when enabled, will track where in your code objects are being acquired, including the count. This makes is much easier to see where large numbers of objects are being acquired but not released. Tracing is slow though, so it should only be used on a limited number of object pools, and explicitly when you’re trying to track down an object leak. This shows the Fighter pool has had objects allocated from the fighter.js and enemy.js source files. The two numbers following the source URL is the line and column number in the file, and the final number in brackets is the number of objects allocated by that code. From this output you can see that it’s likely the enemy.js allocations are not being released. However, that helpful automatic garbage collector can sometimes step in at the wrong time and cause issues with your game. But with some care it’s easy to minimize the number of objects you create, as well as make sure they are ready for collection. When that isn’t enough, techniques like object pooling help substantially reduce garbage collection by removing it from the picture entirely. At Playcraft we’ll be continuing to improve the object pooling system, and your suggestions and code contributions are most welcome. 1. the Gist inserted in the article just don’t work. Oh, and one more thing : does Gamecore.js is really limited to game development, or can it be used elsewhere?